Photo from Kodao Production’s website. Araneta said Felix Salditos alias Ka Dudi, Eldie Labinghisa alias Ka Elton, Karen Ceralvo alias Ka Liway, and Liezl Nadiola alias Ka Mayang were members of the CPP’s education and propaganda staff in the island who were in Antique to investigate people’s complaints. Araneta said among the problems brought forward by the people in the province included demolition of urban poor houses, concerns of poor and small fisherfolks, the poverty of workers and sacadas, soaring prices of commodities and expenditures, among others. She added that the two others, Jason Talibo alias Ka Bebe and Jason Sanchez, provided technical services in order to facilitate their research and study of the conditions of the most backward province in Panay. “(U)nlike the fascist troops who conceal their casualties, we are proudest to acknowledge and claim Ka Dudi, Ipoy, Elton, Liway, Mayang, Bebe and Jason. We boast of them as among the best sons and daughters of our motherland,” Araneta said. Araneta said the martyrs gave the ripest and most productive years of their lives to the utmost service to the people and for the advancement of the revolutionary struggle in Panay. The seven were killed after midnight of August 15 in Barangay Atabay in what the San Jose police and the Philippine Army’s 301st Infantry Brigade Intelligence Task Group said was a 30-minute firefight. NDF-Panay, however, said the incident was a brutal massacre, planned and executed by the Philippine National Police and the Philippine Army. Araneta said the seven victims were all asleep and unarmed, contrary to claims by the raiding team that a grenade, a .38 revolver, one KG-9, an M203 grenade were found at the scene that could hardly sustain a 30-minute clash if there was indeed a firefight. She also questioned the police claim that the raiding team went to the area to serve warrants of arrest against two of the victims. “If their intention was to serve the warrant, why execute it in the middle of the night, under cover of darkness? And to think that (they) had a hundred men deployed just to capture two personalities,” Araneta said. Araneta also belied that the victims were members of the NPA’s taxation team or were planning to raid the San Jose police station. Families of the victims in a press conference in Iloilo Thursday described some of them as writers, with Salditos cited as a notable painter and writer. 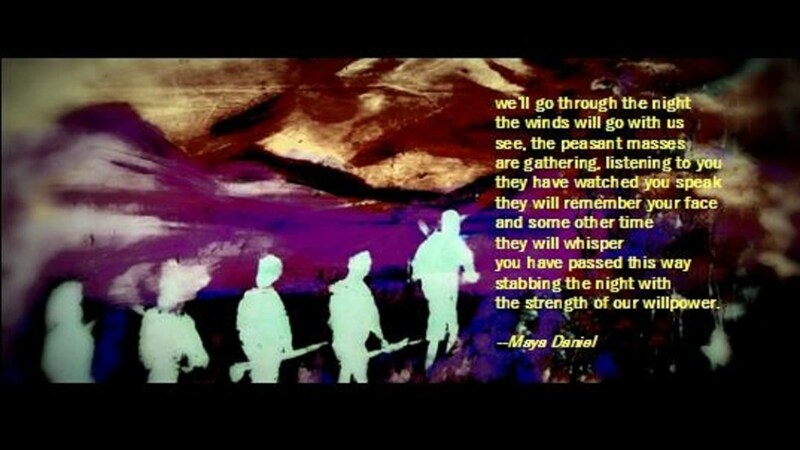 Sources told Kodao that Salditos was the poet and visual artist Maya Daniel. Tributes to Daniel’s poetry in his Facebook account quickly poured, hailing him as an inspiration and thanking him for his sacrifice. Araneta said their martrys were smart and diligent comrades who shared their learning and knowledge to the younger generation of revolutionaries.